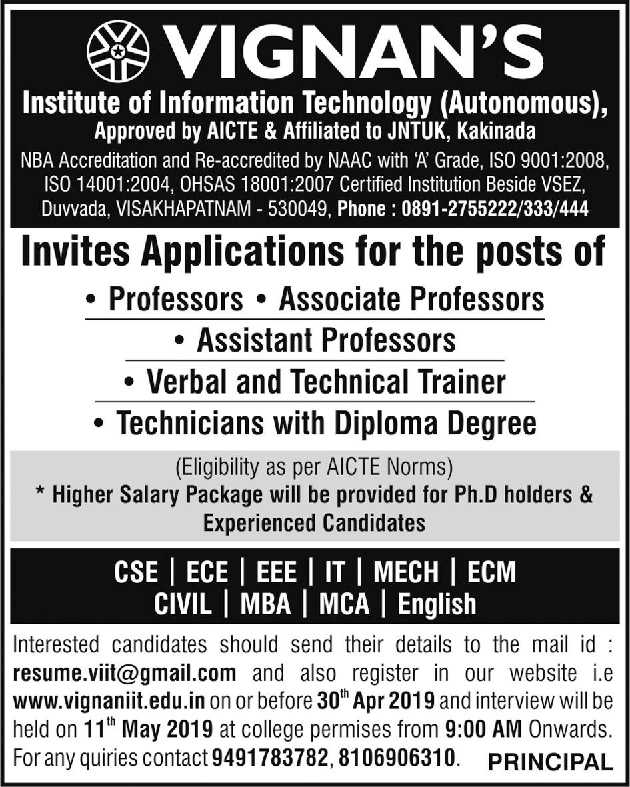 Vignan's Institute of Information Technology, Visakhapatnam has advertised in THE HINDU newspaper for recruitment of Professor / Associate Professor / Assistant Professor Plus Non-Faculty jobs vacancies. Interested and eligible job aspirants are requested to apply on or before 30th April 2019. Check out further more details below. How to Apply: Interested candidates are requested to send CV along with copies of certificates and recent PP size photo to the email address provided below. Also register at the official website provided below. 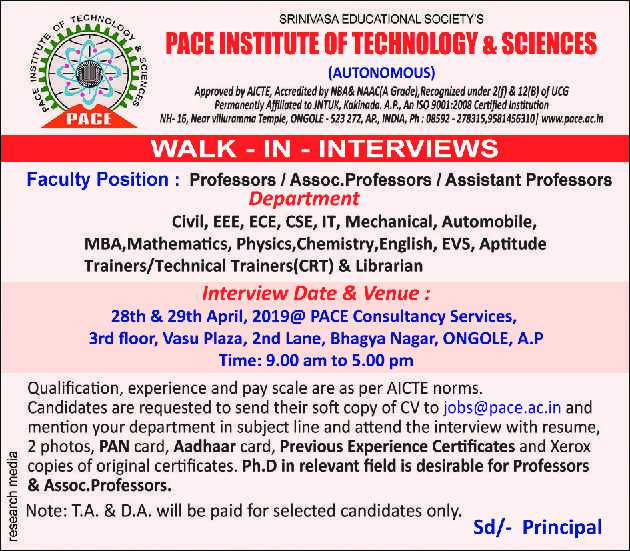 PACE Institute of Technology and Sciences, Ongole has advertised in THE HINDU newspaper for recruitment of Professor / Associate Professor / Assistant Professor Plus Non-Faculty jobs vacancies. Interested and eligible job aspirants are requested to walk-in on 28th and 29th April 2019. Check out further more details below. About College : PACE, being an NRI's project is committed to create a world class technical education. It has been established with a vision and a mission to develop it as an incubator of innovation and knowledge creation in the field of science and technology. PACE was established under Srinivasa Educational Society in 2007 and it has been running successfully since the academic year 2008-09. How to Apply: Interested and eligible candidates are requested to send soft copy of Resume along with copies of certificates, testimonials and recent Passport Size photograph to the email address mentioned below and then attend the Walk-in interview with all originals certificates, PAN card, Aadhaar card, previous experience certificates and Xerox copies of all certificates / documents to the walk-in address mentioned below. Walk-in Dates and Time: 28th and 29th April 2019, 09:00 am to 05:00 pm. T.A and D.A will be paid for selected candidates only. 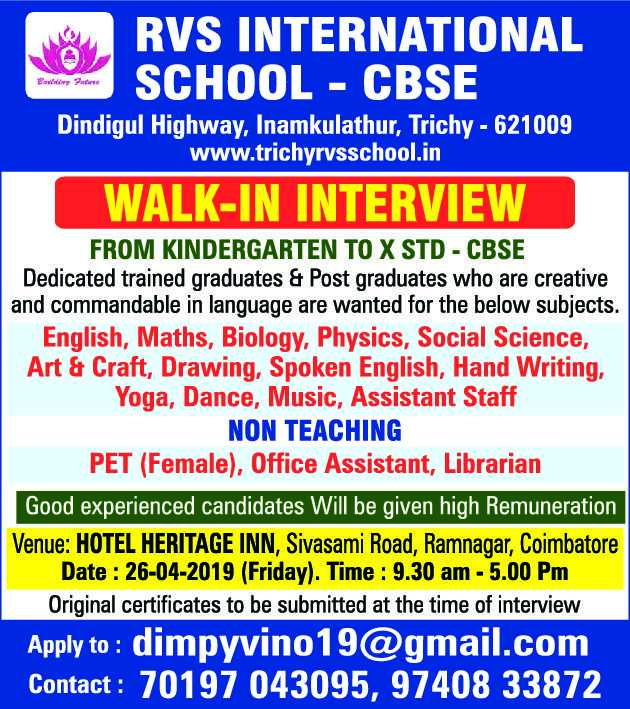 RVS International School, Trichy has advertised in THE HINDU newspaper for recruitment of Teachers jobs vacancies. Interested and eligible job aspirants are requested to walk-in on 26th April 2019. Check out further more details below. About School : RVS International School is a Co-Educational Secondary School institution affiliated to the CBCE on Provisional basis since 2009. The school has been operating officially under the trust/society Rvs Educational Trust ( Trichy). The school is equipped with 12 class rooms and all essential facilities. If you're looking for details in admission/application forms, fees, school timings, vacations/holidays schedule or facilities provided, kindly visit the relevant department of the school. Dedicated Trained Graduates and Post Graduates Teachers are required to apply. How to Apply: Interested and eligible candidates are requested to send soft copy of Resume along with copies of certificates, testimonials and recent Passport Size photograph to the email address mentioned below and then attend the Walk-in interview on 26th April 2019 at 09:30 am to 05:00 pm. Original certificates are to be submitted at the time of interview. 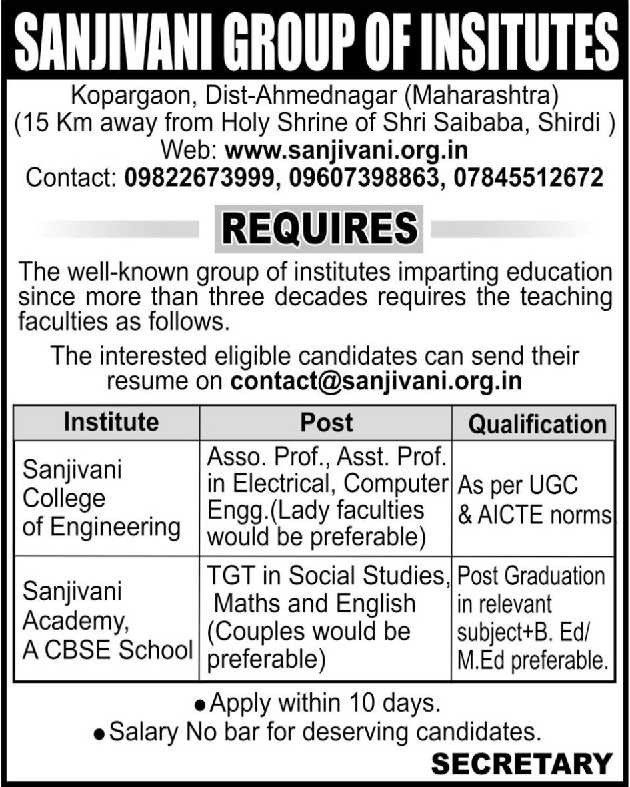 Sanjivani College of Engineering, Ahmednagar has advertised in THE HINDU newspaper for recruitment of Associate Professor / Assistant Professor jobs vacancies. Interested and eligible job aspirants are requested to apply within 10 days from 24th April 2019. Check out further more details below. About College : Sanjivani College of Engineering, Kopargaon is one among the premier technical institutes in Maharashtra state in the un-aided sector. Established in 1983 by the Sanjivani Rural Educational Society under the charismatic leadership of Shri. Shankarrao G. Kolhe, the Institute had its vision for social transformation and , upliftment of rural masses through education, training and research. How to Apply: Interested and eligible candidates are requested to send soft copy of Resume along with copies of certificates, testimonials and recent Passport Size photograph to the email address mentioned below. Info Institute of Engineering, Coimbatore has advertised in THE HINDU newspaper for recruitment of Professor / Associate Professor / Assistant Professor Plus Non-Faculty (Placement Officer) jobs vacancies. Interested and eligible job aspirants are requested to apply within 10 days from 24th April 2019. Check out further more details below. About College : Established in 2007 by Dharbari Charitable Trust, Info Institute of Engineering (IIE) is a dynamic technological institution with a mission to provide highest quality engineering education to its students, encouraging research and entrepreneurship, and molding its students into full-fledged professionals. The motto of the college is to enable the students to not only make a living but also to help them live a quality life by developing futuristic skills. How to Apply: Interested and eligible candidates are requested to send hard copy of Resume along with copies of certificates, testimonials and recent Passport Size photograph to the postal address mentioned below. R.G.M. 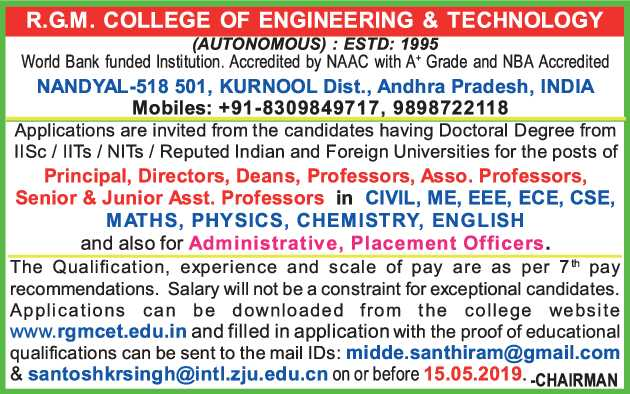 College of Engineering and Technology, Kurnool has advertised in THE HINDU newspaper for recruitment of Professor / Associate Professor / Senior Assistant Professor / Junior Assistant Professor / Deans / Principal / Directors Plus Non-Faculty jobs vacancies. Interested and eligible job aspirants are requested to apply on or before 15th May 2019. Check out further more details below. As per AICTE norms. Ph.D will be preferred. How to Apply: Interested and eligible candidates are requested to send their application in prescribed format downloaded from college website along with copies of certificates, testimonials and recent Passport Size photograph to the email address mentioned below. 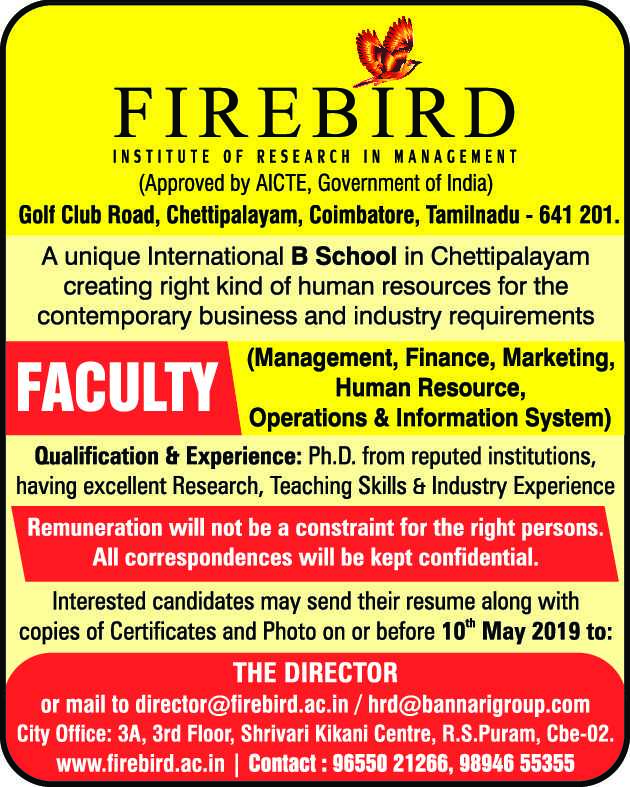 Firebird Institute of Research in Management, Coimbatore has advertised in THE HINDU newspaper for recruitment of Teaching Faculty jobs vacancies. Interested and eligible job aspirants are requested to apply on or before 10th May 2019. Check out further more details below. 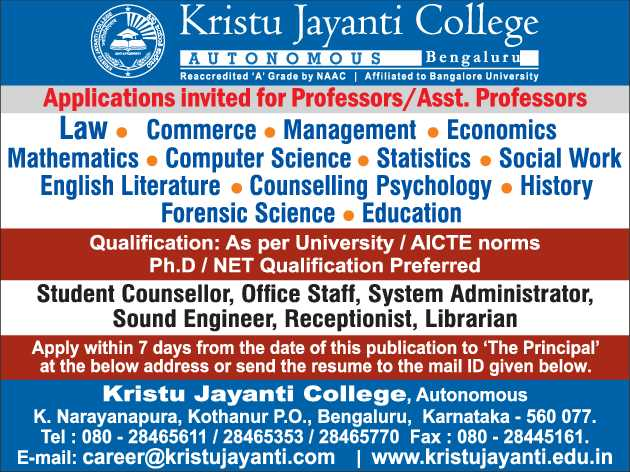 Kristu Jayanti College, Bangalore has advertised in THE HINDU newspaper for recruitment of Professor / Assistant Professor Plus Non-Faculty jobs vacancies. Interested and eligible job aspirants are requested to apply within 07 days from 24th April 2019. Check out further more details below. About College: Kristu Jayanti College, founded in 1999, is run by "BODHI NIKETAN TRUST", formed by the members of St. Joseph Province of the Carmelites of Mary Immaculate (CMI). The college is affiliated to Bangalore University and is accredited with highest grade 'A' by NAAC. The college is recognized by UGC under the category 2(f). The college was accorded autonomous status from 2013 by the University Grants Commission, Government of Karnataka & the Bangalore University. As per AICTE / University norms. Ph.D / NET qualifications preferred. Amrita Polytechnic College, Nagercoil has advertised in THE HINDU newspaper for recruitment of Lecturers / Sr. Lecturers / HOD / Principal jobs vacancies. Interested and eligible job aspirants are requested to apply within 14 days from 24th April 2019. Check out further more details below. About College : Amrita Polytechnic College started by Mata Amritanandamayi Math in India with the main objective to function as a catalyst to foster the growth of core engineering skilled manpower in Civil, Mechanical, Electrical, electronics and computer fields. 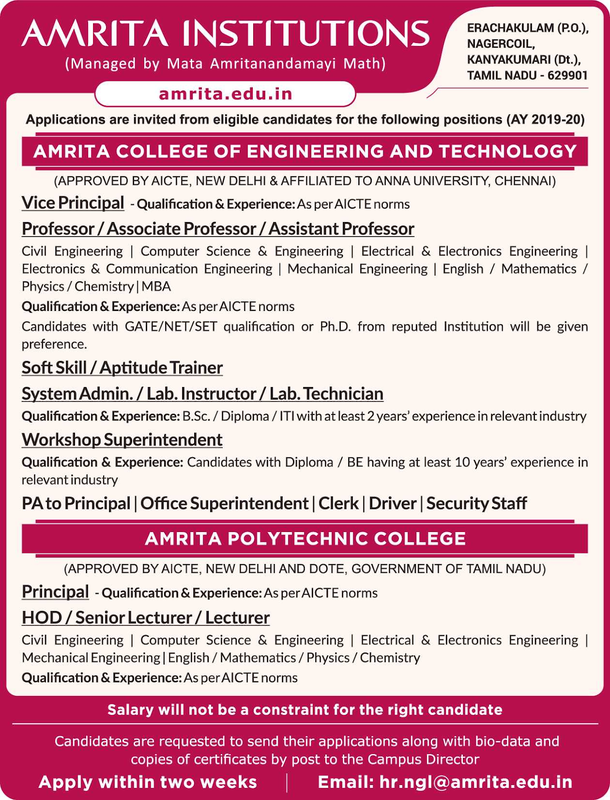 Amrita College of Engineering and Technology, Nagercoil has advertised in THE HINDU newspaper for recruitment of Professor / Associate Professor / Assistant Professor / Vice-Principal Plus Non-Faculty jobs vacancies. Interested and eligible job aspirants are requested to apply within 14 days from 24th April 2019. Check out further more details below. About College : Amrita College of Engineering and Technology is managed by Mata Amritanandamayi Math and the courses offered in ACET are approved by All India Council for Technical Education, New Delhi. ACET offers 5 undergraduate programmes in Engineering, 2 post graduate programmes in Engineering and MBA Programme. As per AICTE norms. Candidates with GATE / NET / SET or Ph.D qualifications from reputed institutions will be preferred. 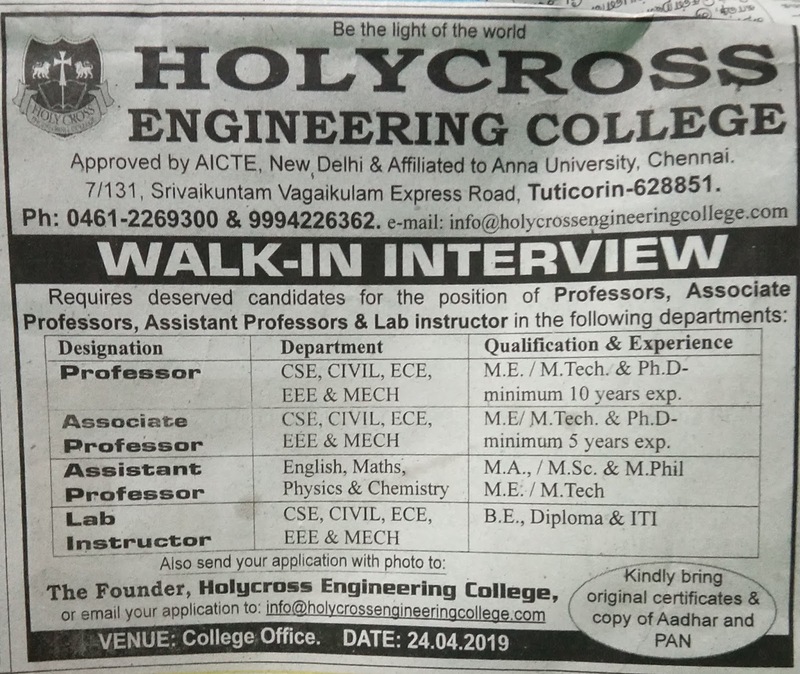 Holycross Engineering College, Thoothukudi has advertised in the DINATHANTHI newspaper for recruitment of Professors / Associate Professors / Assistant Professors Plus Lab Instructor jobs vacancies. Interested and eligible job aspirants are requested to walk-in on 24th April 2019. Check out further more details below. 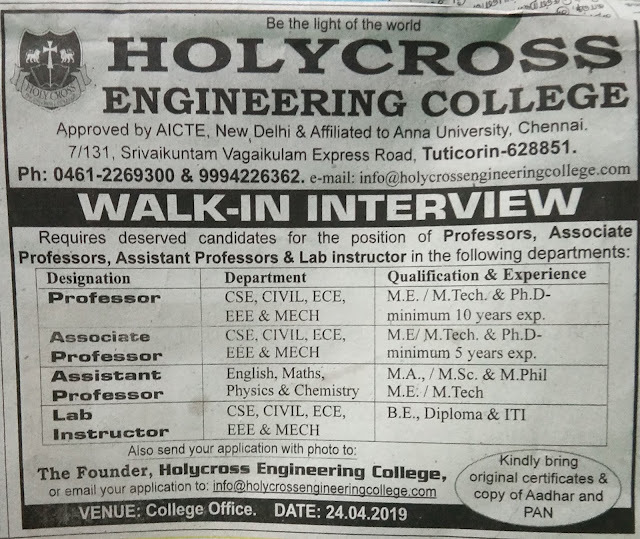 About College: Holycross Engineering College, having developed the concept for true education and intellectual integrity, is a Holistic learning environment. HEC focuses on providing world class coaching for its students. The working environment is such that students as well as faculties are inspired and supported to obtain Higher Standards of Education and Skill sets and Shine in their chosen area of Specialization. How to Apply: Interested and eligible candidates are requested to attend the Walk-in interview along with originals & copies of certificates / testimonials and recent passport size photos to the walk-in address provided below or apply by email or postal. 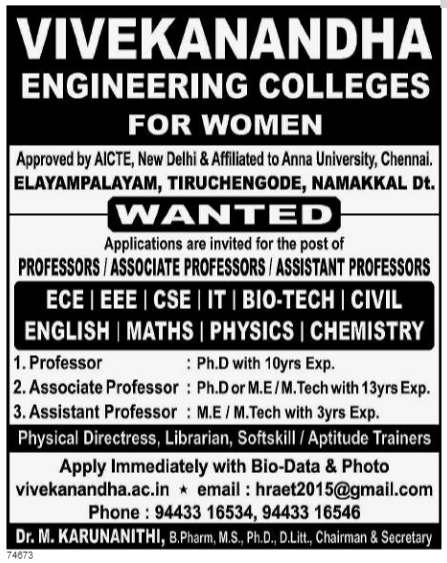 Vivekanandha Engineering Colleges for Women, Namakkal has advertised in the DINAMALAR newspaper for recruitment of Professors / Associate Professors / Assistant Professors Plus Non-Faculty jobs vacancies. Interested and eligible job aspirants are requested to apply immediately from 21st April 2019. Check out further more details below.